Excellent writing is the backbone of all good public relations, but today, any great story is made better by adding compelling visuals. According to NewsCred: 40% of people will respond better to visual information than plain text. With that said, we thought it a good time to review some excellent ways to make sure you’re incorporating images in a meaningful way in your communications. Go beyond Google images. Despite its ease of use and plethora of pics, Google Images is the last place you want to go to pick pictures for a post or other image need. It is safe to assume that nearly all the images you find on Google or another search engine)are protected by copyright law. Using them without permission could result in legal action. Take some time to explore the sites that offer free or very low-cost public domain images like those found at Pexels, PicJumbo or others found in this article. Size matters. And varies depending on your need. For a blog post – check with your hosting site to see how large you should go. The worst thing you can do is select an image that is too small and try to enlarge it for your purposes. This just looks blurry and unappealing so it pays to take some time to understand the requirements of each medium. For journalist submissions we are always told “hi-res” which is defined as over 300DPI. But it really pays to ask journalists what they prefer. Learn about file-sharing. It used to be simple. You had an image that you attached to an email and sent off to a reporter. But file size has grown and email security settings have changed, so today we all use file-sharing services to send images to the press. Take advantage of the free transfer services available. We like the one designed for creatives, WeTransfer, which provides a customizable link to send to your recipient – making the whole experience efficient and professional. Know your file formats. If you really want to up your image game, get to know the different file formats and the pros and cons. JPG (or JPEG) has become the standard image of the web. JPG images are ideal for rich color photographs, gradient images. JPGs are also “loosely,” which means they retain all color information but compress file size which can result in a loss of quality. GIFs are lower quality images than JPGs and are great for those with simple illustrations and blocks of colors (not the best option for photographs). GIFs are also widely used in animation because it is the only file type that enables transparency and interlacing. PNGs are becoming more popular. PNGs support many more colors than GIFs and they don’t degrade over time with re-saves like JPGs. This file type is good for logos, charts, etc. SVG is vector format that will remain sharp and clear no matter what device you view it on. Should you embed photos in press releases? The jury is out on this question. 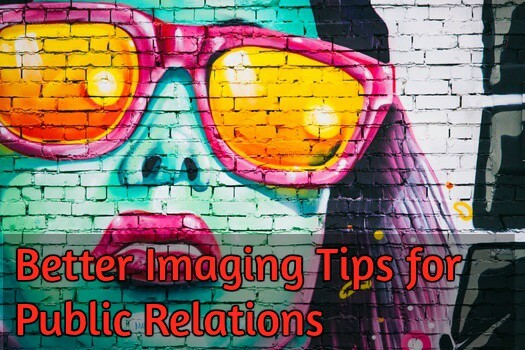 Many PR agencies believe that photos embedded in releases trigger spam filters and are therefore never reaching many of the media to whom they send. On the other hand, if a story is truly visual, it warrants a good-quality photo to make a splash. We recommend doing some of your own research to see what your media contacts have to say.